The geographic organizing aspect of GIS has been part of GIS thinking from the beginning, but now factor in the impact of the web. The new Web GIS provides an online infrastructure for making maps and geographic information available throughout an organization, across a community, and openly on the web. This new vision for Web GIS fully complements, integrates, and extends the work of existing GIS professionals. Web access to data layers is straightforward: every layer has a web address (a URL) making it easy to locate and share online. And since every layer is geo-referenced, Web GIS becomes an engine of integration that facilitates the access and recombination of layers from multiple providers into your own apps. Web GIS extends the reach of the work of GIS professionals to others inside of their organization and to their constituents and beyond. Web GIS revolves around the map. It’s framework for your data and the primary geographic container that gets shared and embedded in your apps. 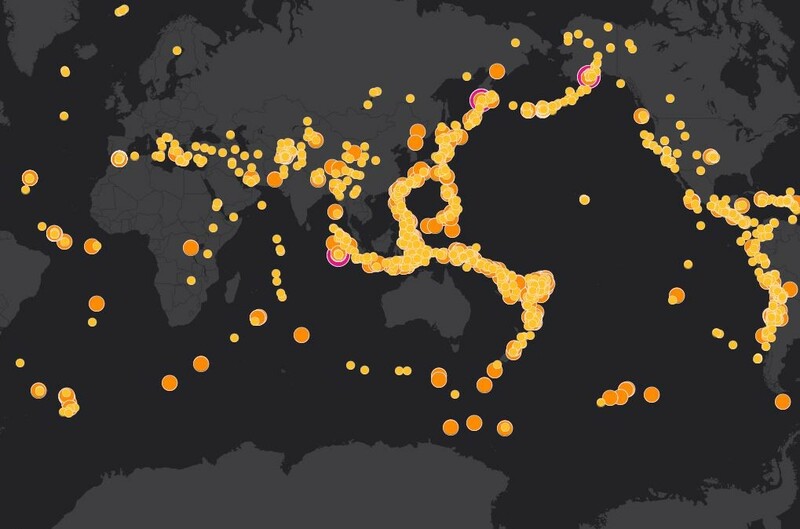 In ArcGIS it is called a “web map.” The purpose of the web map below is simple enough: to show the last 60 days of earthquakes everywhere on earth. This simple live map shows earthquakes that happened over the previous 60 days. There are several points of interest right here on this map. First of all, it’s navigable, which means you can pan and zoom. The map actually has many zoom levels, each level revealing more detail the closer you get. Click on any earthquake symbol to learn the magnitude and date of each event. These little windows of information are called “pop-ups,” and by the time you finish this chapter, you’ll know how to configure them. The map also has scaled symbols, showing the relative magnitude of each earthquake. The background map is symbolized as well, in this case in muted dark tones that set off the bright earthquake symbols. This data, organized with this combination of symbology, reveals an interesting pattern: the well-known Ring of Fire. This map could be easily embedded on any web page. But where did it originate? It began life as a web map in ArcGIS Online, in the Map Viewer.